High levels of copper and other mineral imbalances are found in women who have a prior or current use of birth control pills or an IUD. There is a often strong correlation to those high in copper with other altered minerals and heavy metals relationships than can trigger many types of symptoms after birth control or copper IUD use. Doing a hair test will inform you of your exact mineral status and help you determine the actual level of unbound copper as well as other nutrient imbalances after taking birth control pills. Once these imbalances are corrected with nutritional rebalancing, the symptoms of headaches or migraines can be reduced. Birth control pills increase all types of female cancers – breast, liver and ovarian. All birth control pills raise copper levels. Birth control pills can change a woman’s normal flora, allowing yeast and other pathogenic organisms to thrive. Alters Mate Preferences – read this study! Birth control pills deplete a woman’s body of folic acid, B12, and B6 vitamins. A deficiency in any of these may result in anemia, birth defects, depression and other serious conditions. Birth control pills impairs a woman’s ability to build muscle even when they exercise. 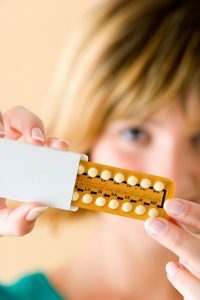 The hormones in birth control pills suppress the body’s natural production of estrogen and progesterone through a negative feedback loop mechanism. This prevents ovulation and thins the uterine lining. Birth control pills flood a woman’s body with high doses of artificial estrogen and progesterone. This causes the production of natural hormones to turn off, preventing ovulation and thinning the uterine lining. Birth control pills can thin a woman’s bones leading to osteoporosis.